This is my weekend project. I have three large windows in my living room/dining room, so why not capitalize on the empty space by filing it with holiday cheer? 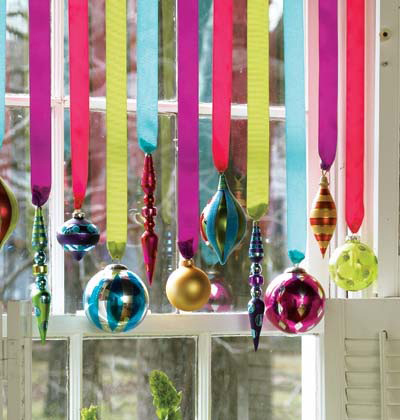 Target has hundreds of colorful, vibrant ornaments right now, and ribbon is only a craft store away. Plus, I love that the colors are not the traditional red and green. Another benefit, I can take this decorating idea to another home once I eventually move out of my cramped apartment.